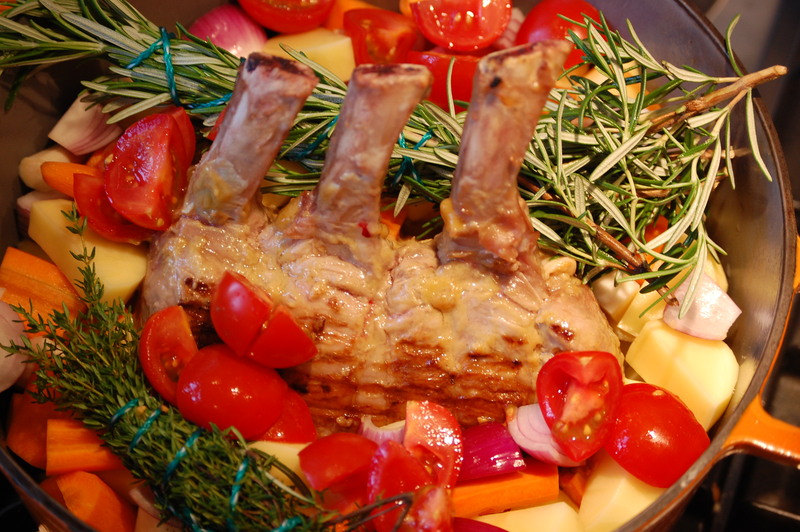 Roast of Veal – Food for Champions? I do not eat a lot of meat. I call it inefficient food as it mobilizes way to much energy in my body to digest it. But when I do, there is nothing like a good roast of veal. I love to cut fresh rosemary and thyme in the garden, bundle them up, cut lots of red onions, carrots, parsley roots (this was new), tomatoes & potatoes. While I quickly prepare 1.5dl a broth for the veg and the meat at the bottom of the cooking pan before throwing everything for 2 hours in the oven, I “flash-grill” the meat. And then 160 degrees for 2 hours. time to drink a glass of red. Author 2seventyPosted on September 23, 2012 September 24, 2012 Categories Alain's Cooking, Off The ShelfTags cooking, food, Own Food Creation, Roast, rosemary, thymeLeave a comment on Roast of Veal – Food for Champions? Donna Hay is “my Jamie Oliver”. . . I have never thought, with my Swiss-French origins that I would take an Australian cook as reference. But I have now done dozens of recipes from her and they always pan out. No bad surprises with quantities, cooking times given can be trusted etc…. I like the assemblage of ingredients and her simple, modern way of cooking. I always think of myself an absolute rookie when it comes to baking desert. I treat even the simplest desert recipes with greatest respect and measure everything with the constant fear of doing something wrong. Here is a simple cake recipe I tried and found quite nice…especially when accompanied by a sweet white wine. Preheat the oven to 160. Place the butter, sugar and honey in a bowl and beat until light and creamy. Add the eggs, one at a time, and beat well. Fold the flour and baking powder into the butter mixture. Spoon the mixture into 12x 1/2 cup capacity lightly greased non-stick muffin tins. Bake in the over for 15-20 minutes or until cooked when tested with a skewer. Cool the cakes on wire racks. Spread the cakes with the cream. Before serving, drizzle with the chilled honey. This recipe is a classic in our family. It is done in less than 30 minutes with a ready made curry paste. It may sound like a sacrilege to use ready made paste, but I swear the one I buy from my local Asian store is so good, I can’t beat it! so why bother? Heat a large frying pan over medium-high heat. Add the oil and the onion and stir until golden add the paste and cook the mixture 3 minutes. Add the stock and reduce the heat to medium. Add lemongrass, aubergines and beans. Cook for 10minutes. Add the coconut milk, prawns and the baby corn. Cook for another 10 minutes. Stir regularly. When cooked, remove the lemongrass, serve curry on 1 side of the plate. Add some roughly chopped coriander on top of the curry. Serve with Basmati rice. This is one of my all-time favorite pasta recipe. The original recipe, from Michele Cranston in Marie Claire’s cook-book “Fresh”, foresees spaghetti but I prefer it with penne. It really is fresh, “mid-summery” and I love the mix of parsley & capers. Bring a large saucepan of salted water to the boil for the pasta. Heat a deep frying pan over a medium heat and add the olive oil and garlic. Move the garlic around the pan with a spatula until it is lightly golden and then add the grated zucchini. Slowly braise the grated zucchini, stirring it as it cooks, for about 15 minutes or until it begins to dry out and catch on the bottom of the pan.